Having just completed the bizarre ‘How to Solve the Cube’, an oddly fascinating documentary surrounding one of Britain’s biggest ever conundrums, filmmaker Alan Birkinshaw quickly took to direct this decidedly awful WWII cannibal-themed jungle drama which offered a surprisingly above average cast, albeit portraying some pretty incompetent characters! Fans of Birkinshaw’s “schoolgirls in peril” exploitation classic Killer’s Moon would undoubtedly feel cheated here, deserving so much more than this muddled gut-munching mess, featuring Hollywood “leading man” Stuart Whitman, tough guys Woody Strode, Harold “Odd-Job” Sakata (in what became his final screen appearance) and Emanuelle star Laura Gemser. Originally titled Horror Safari, this cheaply made Italian-funded effort, involving a fortune in missing Japanese gold, kicks-off with a small Japanese platoon being ambushed by cannibalistic savages; hiding their consignment of gold, the ‘survivors’ are later tracked by greedy fortune-hunters, a motley bunch to say the least, in a cast headed by Whitman as a boozed-up jungle expert, the aptly named Mark Forrest. 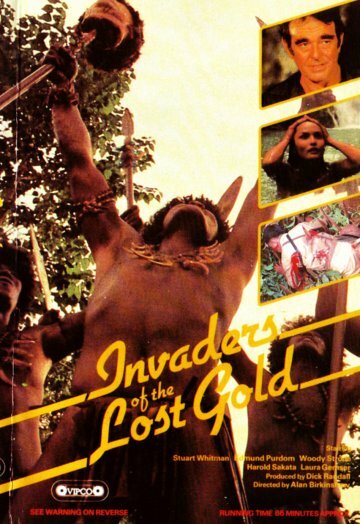 Issued on a dual-license basis, VIPCO had sub-licensed Invaders of the Lost Gold to Howard Rosen’s AVI label, a deal that consisted of no less than two other films, including pre-cut editions of Don Schain’s Ginger and The Abductors – both missing a combined 23m 48s of violent and sleazy footage. As recently as May 2003, virtually 20-years after its outing on tape by AVI, Invaders of the Lost Gold received a digital rebirth in the US, appearing in a scratched-looking DVD print by Crash Cinema Media – auspiciously representing the company’s premiere release – touted as being somewhere in-between Ruggero Deodato’s Cannibal Holocaust and Spielberg’s Raiders of the Lost Ark!